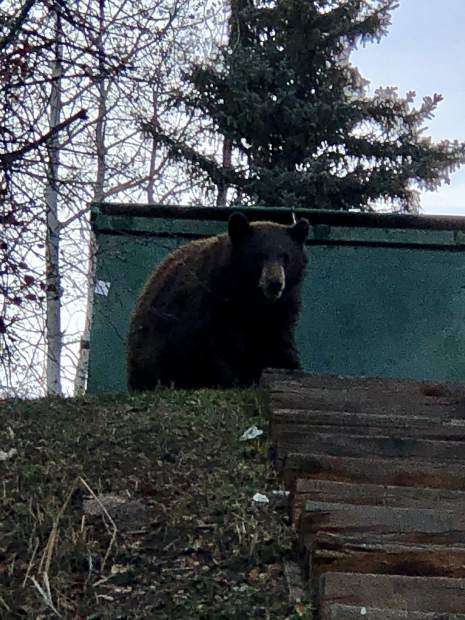 The second, larger and darker-colored bear that has been regularly making the rounds looking for food in the Aspen Business Center area neighborhoods. Two Indiana hunting instructors will not be able to hunt or possess firearms for two years after pleading guilty Tuesday to killing a bear in Pitkin County and leaving the carcass behind nearly a year and a half ago. Dan Roe, 55, and his son, Alex Roe, 27, pleaded guilty to willful destruction of big game, a felony, as well as misdemeanor counts of failure to dress or care for wildlife, illegal possession of wildlife and hunting without permission. As part of a plea deal with the District Attorney’s Office, the two men were sentenced to two years of unsupervised probation. The felony will be wiped from their criminal records if both stay out of trouble for the next two years as part of the agreement. The hunting ban applies to the entire country, Sollars said. The hunting ban for the Roes in Colorado could extend beyond the two years, Sollars said, because the guilty pleas to the misdemeanor counts will add “suspension points” that could lead the Colorado Parks and Wildlife Commission to impose an additional ban. Alex Roe has a taxidermy business in Indiana, and both father and son teach and train hunters and archers “how to properly hunt,” Nedlin said. The two men were hunting with a valid permit Sept. 13, 2016, and said they didn’t know they shot the bear after it wandered into a zone where they weren’t allowed to kill it. The killing took place at or near the Pitkin County Landfill. In May, the DA’s Office said the two took the bear’s head and hide and left the rest behind. Nedlin said the Roes packed out some edible bear meat, but couldn’t handle much of the 700-to-800-pound bear because Dan Roe injured his back. When they arrived in Glenwood Springs, they asked a woman at Colorado Parks and Wildlife if they needed to go back for the bear meat and she told them they didn’t, he said. The woman later said she didn’t remember having the conversation, Nedlin said. The Roes would not have informed CPW of the killing if they had intended to walk away with just the hide, he said. They, instead, would have gotten on a plane back to Indiana without telling anyone if that was the case, Nedlin said. Sollars, however, took exception to that sequence of events. He said the men “made zero effort” to harvest the meat and merely “killed a bear and left the carcass to rot.” In addition, they covered the bear carcass with trash in an effort to hide the killing, he said. “That indicates they had no intention of coming back,” Sollars said. Nedlin said the trash was meant to cover and protect the carcass until the Roes could come back for the rest of the meat. Alex Roe told Judge Chris Seldin that it had been a dream of his and his father’s to go bear hunting in Colorado, and they finally got the money together to do it. “We wouldn’t come out here … to do something like this,” Alex Roe said. Seldin waived the fines associated with the misdemeanor counts because the Roes made a donation to CPW’s Operation Game Thief that was more than the sum of the fines they would have owed. Colorado law requires hunters who kill bears to present the animal’s pelt and carcass to a parks and wildlife official within five days of the kill. Bear hunting is allowed in Colorado in September, October and November, though different parts of the state have different restrictions.